About a year ago, I went into a mild panic when our computer appeared to be on the outs. After a certain two year old dropped it on the ground, the hinge broke, pulling the keyboard up with it. I was freaking out because it was a few days before I was having Sam and I didn’t want to be stuck for four plus weeks without Internet while the thing got repaired. A few days later, I found a temporary solution – break the hinge completely off, then put a piece of tape over the hinge area to hold it together. I figured this would get us through until we had time to send it off for repair. I also diligently backed up our files, burned CD after CD of pictures and videos of Addi, and crossed my fingers the tape would hold out for a few weeks. Fast forward to today. Our computer is STILL held together with packing tape. I’m thinking of upgrading this weekend to duct tape. You know, to jazz things up a bit. The tape works pretty well actually. We didn’t have to go computer-less for several weeks, which made me happy. And Jay (my cheap thrifty husband) loved the virtually free solution I came up with. So over the last year we have been a tad gentler with the computer all the while mocking the PC-gods who dared say we should get a new computer instead of getting ours fixed. “It’s perfectly fine!” we said. “We LOVE tape!” we chanted. Then, the question came into play. The question MARK. 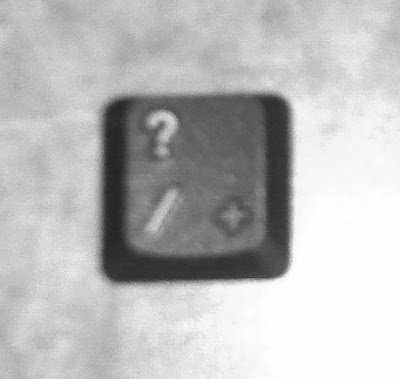 The question mark key totally fell off the keyboard the other night. And although it’s not nearly as critical as the period key or the return key, the question mark is a fairly useful punctuation mark. Especially when you have a three year old and want to blog about their day. Why, Mommy? What, Mommy? Why? Why? Why??? I did have a moment of panic when I couldn't find the key itself... Visions of finding it in Sam's diaper danced through my head until I rescued it from beneath the couch. This is of course not a critical issue for my thrifty husband, of course, so computer shopping is out of the question. Although I think I’ve got a good case to go buy a back up hard drive now. Just in case. I spell Creepy with a "K"